The minimal settings cover most newer Macs, but if you want the game to play well and have the settings turned up, you’ll need a beefier machine. 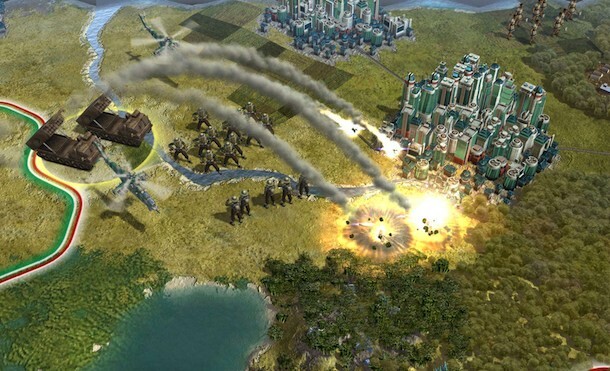 If you don’t have it yet, you can buy Civilization 5 for Mac on Amazon and get free shipping . It’s under spec—and apparently unsupported—but I’d be really interested to see if this would run on a 2.13ghz Macbook Air with the GeForce 9400M. I think you will run into trouble with the video card, it might not even launch. I had this happen with TF2 earlier in the year on an old Mac Mini. The new MacBook Air should run it OK with settings lowered. It might not look it from a few screenshots, but Civ V is really graphically intense and the frame rate dips at times even on my gaming PC. Looking at ways to optimise it to run better and more importantly, cooler. My MacBook (mid 2007) has a 2.13 intel c2d with 4mb ram, 2 hard drives ( took out the optical drive, 1 for OS X AND 1 for Bootcamp/win 7) and geforce 9400 video. I have civ v running on window 7 and it plays fine. I run most things on low or med graphics quality and the game is very playable. I’m thinking of getting a new iMac to run this on. Anyone have any ideas what model I should get? Do I have to get the most expensive model? I’m not really an expert in these things. Good grief, Civilization is now recommended to use a quad core processor? What in the world could it be doing to use four processors? On the mac, do you have to run steam in the background, while it’s connected to the internet? I really need to know cause I don’t have network access at home… help? Steam is required and a connection is required the FIRST TIME you play, after that you can play in offline mode. supported graphics card. The game will run just not optimally and frankly the graphics take a hit. I find this baffling since only the newest MacBooks have the 320M. The vast majority of mac laptops in the field are essentially underpowered. And aspyr has no plans to patch. How can I play without steam on mac. is there an option to change somewhere? That means I need to buy a brand new Mac for this game??! 3-4 Years after manufacturing, this machine is STILL a beast – I cannot believe that it won’t run this game. Also considering buying it – GeForce 9400, MacBook 6,1, just below the minimum recommended. I don’t mind the ‘fancy’ graphic, as long as I can play. From what I read above, the game is playable, no? No in high-res, but it’s playable, isn’t it? And the game runs painfully slow… at low settings. Got not other program running, just the OS and Steam. Aspyr did a bad job on porting this game, probably they are using Transgaming or some kind of technology to emulate DX9. I hope they give us a native port in the near future. Slow as f*ck. I could play for a few hundred turns (biggest world, marathon – the longest game type) and the game would eventually crash 100% of time at the same point. All video settings to slow or inactive when possible. 70% of the map was still hidden, Only 4 civilizations revealed. Do not bother buying this pile of garbage, it pretty much won’t install on a modern mac. who formats their disk as case-effing-sensitive? it can’t run on a case insensitive file system??? yah, don’t by this. I have a 2 yr old MacBook Pro, which does meet the min. requirements, but the came runs pretty bad, even at the lowest settings. I also have a window installation on my pro, and the windows version runs like a breeze. Just bought ‘brand new’ MacBook Pro with 2.2 GHz Quad-core i7 processor and AMD Radeon HD 6750M graphics card with 1GB video memory…works smoothly at default graphics settings, but wow…within 15min of playing the computer is heating up and the fan is going crazy??? I bought it after all, and it works. Works fine when I play on the hexagonal map setting, but very slow when I play on the graphic/sprites map setting, the time to render the map, terrain, units, etc. takes forever, but I don’t care for that map setting, in fact I find it confusing, for me the hexagon map works well. We played a 2 players multiplayer game, Large Map (10 civs + 20 City-States and Pangea) up to turn 200, then my MacBook crashed and we couldn’t go further. But we played many, many, and I mean many hours on a standard map setting (8/16) and it went fine, although some turns take a while to process, especially in the later game (turn 300+) you just have to be patient and let the computer work. We would just let it do all its computation during the AI’s turns) and then play/click when it was out turn, it was working great, but if you clicked like mad all the time, it gets a bit overworked. It crashes once in a while, nothing too dramatic. So it *is* playable, in the hexagonal map setting, if you don’t mind it, and are patient: some turn end takes a while to compute, you have to let it work! I wonder why u all bother apple for this piece of sh* software… apple manufactures great hardware and also great operating systems that handles the highly professional software for design, music and video quiet easy! it´s not apple who made this game and if it would be optimized i´m sure it would even run on my old g4 in the hood! Does anyone know of any mac book that will run this game? The AMD rig I built in 2009 with a phenom II x6 and a radeon 5850 in it plays this game like a champ at max settings at 1920×1200. Min frame rates can get choppy at times but I’m averaging well above 35 with all of the eye candy enabled. And when I built the thing all the parts cost less than a grand – less than any macbook pro. I’m thinking of upgrading to a radeon 7970 or 7950 so if anyone wants a 5850 hit me up. Got a MBP Retina 13 inch a few weeks ago and installed civ5 last night. 4GB ram, i5, not sure of the graphics card cause all I says is “isis” graphics, but I can run it in max settings even with the entry level retina. The fan is loud as HELL though, regardless of what settings you’re on.